BMW of North America, LLC and BMW Team PTG jointly announced today that Bill Auberlen, Joey Hand and Justin Marks will drive for BMW Team PTG in the 2006 American Le Mans Series. A fourth team driver and additional drivers for the longer races will be named later. Martin Jensen, Ian James and Graham Rahal also sampled the team’s M3s at the three day test at Sebring this week. Regular 2005 PTG driver Tom Milner is almost certain to be racing a Multimatic Team Panoz Panoz Esperante this year. The two BMWs covered more than 425 laps at Sebring this week, in an impressive display of reliability – while testing more than 50 sets of Yokohama tires, as the two companies renewed the relationship that began in 1995. Bill Auberlen, driving the #21 M3, set the second fastest GT2 time of the test, a 2:03.335 minute lap. “My best years in racing have been with BMW in the American Le Mans Series, and I'm absolutely thrilled to go back with BMW Team PTG and my team-mates to compete at the highest level of sports-car racing," commented Bill Auberlen. 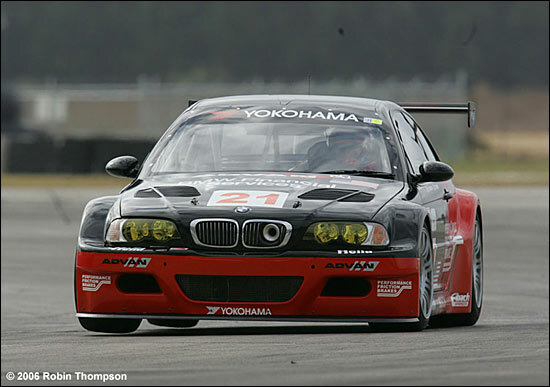 BMW Team PTG scored seven wins in 13 GA races entered in 2005.